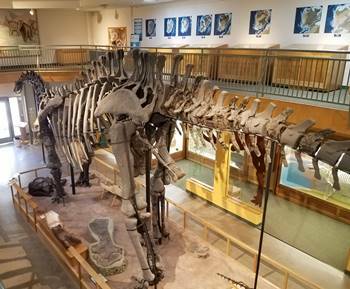 In the heart of the University of Wyoming campus sits a relatively small geological museum that displays a number of dinosaurs and other prehistoric animals, including an Allosaurus nicknamed “Big Al” that is best known for the various ailments it suffered before death–many of which are visible on the skeleton. Wyoming has always been a great place to find dinosaurs, especially from the Jurassic period, and some of the best specimens in museums throughout the world come from this beautiful state. 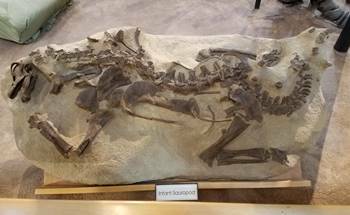 While many former Wyoming dinosaur fossils now reside elsewhere, some of them can be found in the rather small but interesting museum at the University of Wyoming (UWGM). As guests enter the front doors of the museum, the very first sight they will most likely see is the large Apatosaurus staring them in the face. This huge, 80-foot animal was found in central Wyoming, and its beautiful fossil skeleton now stands over the dinosaur gallery. The Apatosaurus is over 60% complete, and in 2015 a new study suggested that this specimen along with several others should be included in the resurrected genus Brontosaurus. Based on a detailed analysis of large diplodocidae, this specimen has enough differences between it and other Apatosaurus fossils to warrant the name change. While a number of scientists agreed with the analysis, others are more skeptical. Since I just visited the UWGM a few weeks ago and saw that they continue to call it an Apatosaurus, I will go along with that until more analysis confirms the genus. A beautiful fossil right underneath the huge Apatosaurus is that of an infant sauropod. It is difficult (if not impossible) to determine the genus of sauropod dinosaur it belongs to, but it is a great fossil to compare to the large adult standing next to it. The astounding growth these animals achieved in their lifetime is one of the most amazing accomplishments of dinosaurs. Toward the back of the main hall is probably the most famous dinosaur in the collection: Big Al. “Big Al” is the nickname given to the Allosaurus on display here, and ironically, it is not particularly large for an Allosaurus. Nevertheless, what is “big” about “Al” is its impact on our understanding of theropod dinosaurs. The subject of a BBC documentary called Walking With Dinosaurs: Allosaurus, “Big Al” is a most interesting fossil due to the various injuries and ailments that the animal suffered before its untimely death at a relatively youthful age. The skeleton at Wyoming has indicators placed on the bones for the public to see the various pathologies that afflicted the dinosaur before its death. One that is easily noticeable to visitors is a misshapen middle toe on its right foot, indicating the animal was suffering from an infection, most likely after breaking the toe bone. “Big Al” is a beautiful fossil, I particularly like the skull, posed with the mouth closed which is somewhat unusual for how museums typically display large carnivorous dinosaurs. My recommendation for visitors is to watch the BBC film before coming to the museum: my sons were both much more eager to see “Big Al” after watching the story about his possible life, and the things that may have caused his injuries and death. While the Apatosaurus and “Big Al” are clearly the highlights of the museum, there are some other interesting fossils on display. One of my favorites at UWGM is a beautiful ceratopsian skull called Anchiceratops. A number of casts of popular dinosaurs can be found throughout the first floor, including the large skulls of Tyrannosaurus and Triceratops. Other wall displays show full-body cast skeletons of Coelophysis and Stegosaurus, and casts of other dinosaur skulls include an adult Pachycephalosaurus as well as Dracorex–a dinosaur which is now widely considered to be a juvenile Pachycephalosaurus. A small herbivorous dinosaur stands near “Big Al” in the main display area. This dog-sized dinosaur was formerly called Othnielia rex, but is now Othnielosaurus–named after the famed “Bone Wars” paleontologist Othniel Charles Marsh of Yale University. The second floor contains fossil displays of several marine reptiles among other sea animals. During the Cretaceous period, much of Wyoming was under the Western Interior Seaway, and the UWGM displays plenty of ammonites and belemnites from this period. A couple of different mosasaurs hang from the ceiling of the museum. A large Tylosaurus is the star, but I also liked a smaller mosasaur nearby, although I did not see any labels/identification for it (it looked like a Platecarpus). There is also a nice display of a cast of the large ichthyosaur Stenopterygius. 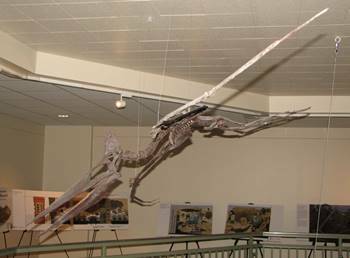 Other fossils of interest in the upstairs gallery are a cast of the Cretaceous bird Confuciusornis as well as a dynamic fossil of the pterosaur Pteranodon, which is displayed in an interesting diving pose. It hangs near the railing where visitors can get a nice close-up view. While many Jurassic period fossils have been found in the state, Wyoming is also well known for its many post-dinosaur fossil mammals. 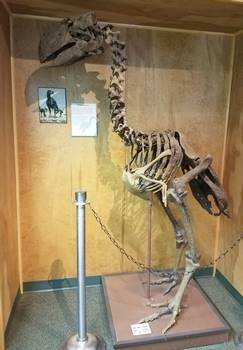 The UWGM displays several nice specimens, the favorite for me and my sons was the giant flightless bird Diatryma (often referred to as a North American species of a similar bird found in Europe known as Gastornis). The museum’s specimen stands in a corner and looks quite impressive, particularly the massive beak and skull. A full skeletal mount of an ancient rhino stands nearby, and a wall display features the North American deer-sized camel Stenomylus. One of the most interesting mammals in the display area is a full skeletal mount of a small grazing herbivore called Eotylopus. This nearly 40-million year old animal is closely related to modern camels, which evolved in North America before spreading out to South America and Asia only 5-7 million years ago. There are really only fossils and some nice paleoart in the museum, but if you really don’t care much for that kind of thing, then the good news for you is that it is a small museum and won’t take very long for the others in your group to see everything. The nice University of Wyoming campus is all around the museum, and the bookstore is a close walk through the main campus mall known as “Prexy’s Pasture.” The campus is quite beautiful, lined with large trees and terrific views of the surrounding landscape, and quite a few interesting sculptures. Off campus, Laramie is one of my favorite small college towns; it boasts a bunch of interesting (and good) restaurants and quite a few things to do. One of our favorites was visiting the old Wyoming Territorial Prison, which between 1872 and 1903 housed a number of notorious criminals such as Butch Cassidy. Like most museums, display space is at an absolute premium at UWGM. For a state loaded with prehistoric fossils, there really aren’t that many on display at the museum. The first time we visited the museum there was a display featuring some designs for a new museum space for which they were beginning a fundraising drive, but I did not see that display on our recent trip, so I’m not sure what the status is for this needed renovation work. My sons have been to the museum twice now, and they enjoyed it both times. Since we had watched the “Big Al” story they were quite interested in seeing the skeleton up close. They also enjoyed going upstairs and seeing the fossils on display there, as well as the nice view of the main floor below. 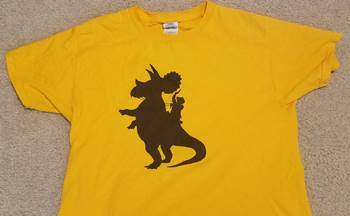 One of my younger son’s favorite t-shirts is one we found on sale at UWGM–a yellow shirt with the University of Wyoming’s iconic cowboy logo–but instead of riding a horse he is riding a Triceratops! 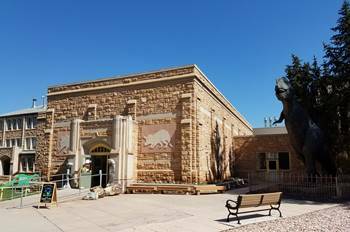 Despite the museum’s small size, there are memorable fossils on display here and given the treasure trove of fossils still waiting to be found in the state, this museum has a lot of potential for future growth–if they can find the funding to support it. 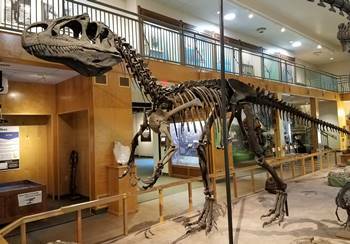 This entry was posted in ancient mammals, dinosaur museums, dinosaurs, Museum Reviews, Natural History Museums, University Museums and tagged Allosaurus, Apatosaurus, dinosaur museums, Museum Reviews, Natural History Museums, University of Wyoming Geological Museum. Bookmark the permalink.